In this episode, I dig deeper into a topic that mystifies many women entrepreneurs – that’s right, it’s time for operations 101! Even if you’re established, it may be a good time for you to evaluate changes you need to make to your operations as you’ve grown. But, if you’re a small business owner or solopreneur, it’s time to document your systems and to gain insight into what’s going well and where you have bottlenecks (areas where delivery is slow or stalled). 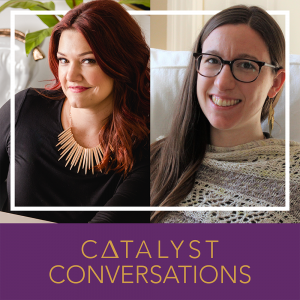 I speak with Jessica Culligan, operations expert and Operations Director for Cocoknits.com. Jessica is a prolific maker and business logistics guru who is passionate about helping female entrepreneurs bring their vision into reality. Jessica has an MBA in Supply Chain Management from the Whitman School of Management at Syracuse University and prior to joining Cocoknits, she worked for 8 years in book publishing, in both production and operations. She has also consulted for several entrepreneurs such as Gertie of Charm Patterns, to launch a successful Kickstarter campaign, which resulted in 300% funding. JM: Hi, Jessica. How are you doing? JC: I’m good. How are you? JM: I am fabulous. I am so excited to talk with you because your expertise is a hot topic around here. JC: Thanks. I’m really excited to be talking with you today. I know operations can sound really intimidating and scary but it’s really not. JM: You make it sound so friendly like you have such a nice voice and it’s like, “Oh, it’s operations,” but yes, it scares the hell out of a lot of my clients and it does seem really intimidating. I think a lot of times we go into business and we don’t necessarily have a formal education in business and we hear operations and it feels sort of jargony but I explain to my clients, “If you are accepting money in exchange for goods or services, you have processes, you have operations. They may not be super effective right now but you have operations,” tell us a little bit about what operations is and what does that looks like for you day-to-day? JC: Sure. Operations can be internal operations or just the running of your company, anything you do kind of broader vision to organize where your company is headed or very granular details in terms of making sure you have what you need to run your business that is all internal operations. There’s also operations in logistics which is more the moving pieces. If you are shipping things, if you’re managing inventory, that is more the operations in logistics piece. Then supply chain management also means operations which is anything from the development of a product or a service through actually getting it out there to the customers, so working with vendors, any sort of the suppliers and everything kind of internally you would do to support that. JM: For example along lines, because supply chain management I think is another one of those terms that people are like, “What is that?” but it’s funny I have a good friend who works for a company where they designed products but they are created in another country and her job in that big process is that she’s making sure that those containers are getting shipped from that country and that they are successfully making it into our country so that things can make it out to store shelves or they can fulfill those through online orders, is that considered supply chain management? JM: You go trial by fire. JC: Yeah, yeah, thankfully, the government isn’t really looking at someone’s Etsy shop to make sure they’re clearing customs right so you have a little room for errors there. JM: Tell us a little bit about what that looks like on your day-to-day job as you go to Cocoknits and you are responsible for operations. JC: I guess everyday I like to look at our inventory. I see kind of where we are with everything if we are close to selling out of something, I have to order it and see if there are changes we want to make on the reorder and then when we are ready to go ahead with communicating with the vendor, I speak with someone at the vendor to get everything in order. When it’s ready, I get different shipping quotes from companies to see who can pick it up and ship it to us for the cheapest price and then I use different templates to create the shipping documents. Basically it’s a lot of planning and tracking and effective communication to other people. It’s not really—in terms of what I’m doing—different than any other department. I have to talk to people, plan things, and move things around. It just happens that instead of like in marketing, it being more of a digital thing that’s happening, like I just have physical things I’m moving around. JM: That makes sense. Tell me a little bit, it’s funny that you bring up other departments, where does operations fit or how does it interact with other departments? Because I think a lot of the times that I see women managing their operations—anyone managing their operations, but I work with women entrepreneurs primarily—we talk about things like something fell through the cracks and we don’t know how to prevent that from happening again so we don’t have the clarity around where it went wrong, we’re reinventing the wheel a lot of times. We, kind of as an individual, if we start our businesses as solopreneur and we grow, we have all the tribal knowledge like we know how the systems work but there’s nothing documented, there’s no repeatable system for someone else to use or we have issues around bottlenecks where we kind of begin our process for fulfilling something. It comes to a screeching halt at some point because somebody’s got a backlog of things that they’re working on, how do you work with the other departments to kind of work through some of those issues? JC: Every time I am looking at a process, so like anything either within a department or between departments, I like to look at what’s the life cycle of the thing. If it’s handling of customers through different service departments or points of contact or if it’s producing some sort of products for your company and then it needs to get developed, marketed, and looked at in these other departments, you need to map out, what does that look like? Where is it going? And what are the different touch points for everybody? Because that can kind of reveal where maybe redundancies are in terms of, “Oh, well, it’s going over to marketing,” but that’s also when sales needs to be looking at it and then we realize there is a problem and then we have to go back to developing something. If you are mapping out the life cycle of the process or the item, then you can kind of see where hold offs are, where too many people are having it at one point, or if basically no one has it and there is no hand off point so you want to look at who’s working on it, who hands it off to the next person and when and then what would they do with it afterwards, is there a point for follow up? Is there a point where it’s clear that they’re going to drop the ball because there’s no point to actually communicate that it’s ready? JM: That’s an excellent point because I do think when things fall through the cracks, it’s the signal that somebody got it and didn’t move the ball forward. It’s understanding what those triggers should be within the process and helping each person along the way understand what’s coming before and what comes after them so when they complete what needs to be done, where does it go next. In terms of documenting that, is that as simple as a Word document outline? Do you use specific software? How do you manage that life cycle? JC: I personally love using Excel for almost everything because I just loved Excel but it’s really not a useful tool if you don’t know how to use it. I would say whatever tool someone is most comfortable using is the best tool for them to start with for this. If you are using Asana to track projects, then maybe watch a couple of Asana videos to see how they recommend actually making a timeline in a project or if you are a creative person and you want to sit down with the pen and paper and literally draw out little boxes of words or pictures and map it out that way, that might be the best way to do it. A Word document for an outline is really helpful if you just want to be able to get it out and then move things around and make notes. I think that instead of adding to your to-do list of things you need to become an expert on, learning a new system, or learning Excel, I think you should work with what you’re really comfortable with to think about it in the way that you think about things. JM: I love that. That is such a good advice because that’s something that we talk about on a regular basis. I would rather you get started that you do it that it isn’t perfect that maybe later you find that you need to rework it within a different program or a different tool but get it started because it cuts out a lot of the frustration and the lack of clarity in the meantime. I think a lot of people are breathing a sigh of relief, I also am personally obsessed with Excel, if I could make everything in an Excel document, I will have like ten-thousand worksheets but I do know that there are a lot of people out there that are not super comfortable with Excel so I think there will be a sigh of relief that there are programs like Asana and there are others that we will list in the show notes for this episode too just to give you some ideas of some of the things that are out there. Even drawing it out, I think that’s brilliant, if you are a creative person and you are very visual, I think sometimes drawing out that process can work really well in terms of finding those places where something drops off or we’ve got a bottleneck or too many people are working on something at the same time. Operation sounds like it is, I mean you make it sound so easy, but it sounds also liked it can be very complicated, how did you get into operations? Did you always feel pretty confident in that role or did it take you some time to get accustomed to being in that role? JC: I definitely was not comfortable when I first started. I worked in book publishing for several years and I started off in the book production department. That was a lot of project management in an operations focus so basically when an editor and a designer were done making the template for their book and with all the content in it, I would work with paper companies and printers and shipping companies to actually make the book a real physical thing and then get it out to stores. That was really fun and I learned a lot of really interesting things like color correcting and how different paper textures can interact with different binding styles. Then from there I worked in operations at a publishing company and I was really nervous because like everybody listening to this, I was like, “I don’t know what operations is and I just got a job as an operations manager.” That was terrifying. But basically it’s just something, like I said I learned almost like a trade, I also wasn’t good at Excel, I knew how to use it basically but I didn’t know pivot tables and VLOOKUP and all these other things that I love now. JM: Ooh, all those advanced things. JC: Yeah, so I just kind of learned on the job and tried to absorb as much information as I could from everybody around me and then figured out that I loved that kind of organizational piece to something creative. I also found that because I’m a creative person, it was fun to see the creative solution for a lot of these kind of logistical problems. I kind of have this unique perspective which then led me to get my MBA in supply chain management which I think the biggest thing I learned from that is that no one knows what they’re doing. JC: Yeah, I really don’t think it goes away. It made me feel so much better because I was thinking, “Oh, okay,” and then I can just ask people who do know the things that I need to know, we’ll figure it out. JC: I really recommended that people go to the Harvard Business Review and just search a company that you want to read about and treat yourself to one of the case studies about them, then you will realize that they don’t know either, they are faced with weird big challenges even on this multimillion-dollar scale or whatever. I read one about Warby Parker, which I love Warby Parker glasses and I think the company is really cool. I read a case study about them and they had this great idea and they started doing it, they got way, way, way more orders than they thought they were going to get ever and so they didn’t have the inventory to support it. It’s this really interesting story that I got to read about how they dealt with that and how they got to that point too, even they went to one of the best business schools in the world and they still made this huge operations mistake, so it was really encouraging. JM: Right, somebody else’s wheels falling off is very encouraging. But you are right, it really does show you that everybody doesn’t have the answers and even huge companies who have top experts and lots of money to throw at issues sometimes, and luckily that’s a high-class problem like it’s great to get more orders then you know what to do, that’s better than hearing the crickets in the background. But it can cause issues with public perception and opinion too if you are not able to fulfill your order so it’s interesting that you provide that example that there are big companies that are also still trying to figure out what they are doing. But obviously it has led them to a lot of success because they are so recognized in the marketplace. But that’s great advice so check out Harvard Business Review. We’ll make sure that those are in the resources for the show notes too, the link to that site to check out those case studies. In terms of some of the advice that you could give to some of the listeners, what are some of the tips maybe that you would share with them? JC: I think that it’s really important to make time to really plan long term. You can’t just run around putting out fires all the time, which I know I definitely am guilty getting caught up in. You need to sit down and treat yourself to a cup of tea and put on some music with no lyrics or something and say, “Okay, I’m still working but my working right now is sitting here and thinking long term about what the plan is,” because if you come up with your initial vision for the company, that’s really exciting that you’ve gotten so far as to actually started but then you need to keep going with your vision, where are you going next? What are your big goals? If you could have everything that you wanted, what does it look like? Then kind of think about how you can get there or how you can position yourself so you’d be able to get there at some point depending on how big you’re dreaming. But you can’t just say to yourself, “Okay, I got this one business idea, I have that kind of running, and I’m so busy with everything day-to-day to really think about the future.” It’s important to think about your long-term plan and then once you kind of have that plotted out a little bit—and it can change—then think about it from every angle, what is that mean you need for marketing or what is that mean you need for sales and operations? Do you need to start coming over the plan to research something that you don’t know or find someone to help you with the next step? JM: I love that. That is such excellent advice because that is a conversation that we have on a regular basis. Sometimes I think the biggest hindrance is that we get to a place where we are finally so busy, especially when you’re starting a business, it’s like you’re trying to make enough money to keep food on the table and keep the lights on and maybe hire someone so that you don’t go insane but then we get bogged down at that step where we stop thinking about those future goals and what we want to have happen. I love what you say also about how big do you want to think? You have to have a vision, you have to have your goals outlined and then you have to think about it from every aspect, the things that you are going to need to do to get there. But that really is such a good point because I would say the vast majority of entrepreneurs that I know who start a business end up stuck in that day-to-day cycle so it’s very good advice. What other tips would you share? JC: I think that it’s important to know your key numbers to look at your key points of data to kind of take the pulse of your company. It can be really nerve-wracking, you’ll lay awake at night thinking like, “Oh, my God, did I do everything I needed to do? Are we going to make [inaudible 00:19:45],” like whatever it is. JC: You need to know what your baseline revenue number is for that keeping the lights on so that you can then look at easily without having to run reports or look back at emails or whatever you are doing like you need to be easily able to open a document and say, “Okay, this is how much we have for last month or the month before or whatever so we are okay right now,” so that you don’t panic during slow moments. One of the things that I do for Cocoknits is every Friday, I give a report to the team of, “This is what we’ve made for the month so far, this is what our forecasted revenue for the month was or is,” and then I started giving the total revenue for the previous year and then the year before that, just because I like to have as much data as possible. JM: I love it. That is really so important too because I think sometimes we all get so busy that it’s hard to really appreciate that we have achieved something. You feel like you’re just trying to accomplish all day everyday and whatever you’re working on today is ultimately one step in a multi-step process and so you are staying focused and I got to cross this off the list so I can do the next thing. But I do think that is a great insight to be able to stop and say, “No, you have to have this list of what you have achieved over the course of this week or this month so that you do recognize that you are making progress.” Otherwise I think it just feels empty and busy. That is great insight. I agree, you have to know your numbers. I think a lot of times entrepreneurs are afraid to look at those numbers because we either aren’t going to like them very much or we don’t know what to do with them. I think that’s really the issue because we talk about how it’s okay to not be hitting the mark, it’s okay to miss the mark but you have to know it in the process so that you can course correct things as you are going. It’s not okay to just let something completely fall flat and not know it until it’s over and it’s too late to do something about it. When you are looking at the numbers, what are the kinds of things, if you say, “Okay, gosh, I know this month is going to be a slow month or I know we’re coming up on a busy month,” how does that change the things that you are doing as you are anticipating those times? JC: I try to look at as much information I have about the historic months, to look at like is this on track with what has happened before? Is it something that’s a new piece of information? Is there like some sort of cause that has had this effect? Because it’s a slow month, instead of panicking, I’m like, “Okay, cool I have time to dig through all this information and figure it out. I also though am someone who has, basically up until recently, been so scared of numbers like I was English major, I am not a numbers person. I’ve not done well in any statistics class I’ve ever taken, so even though I love Excel, I’m not a numbers person. I try to get as much of the story as I can about what’s going on because that makes me feel better so even though the story is being told with numbers, I try and think about it more like that rather than, “I don’t know how to calculate the return on investment. I don’t know what the inventory turnover percentage is,” like those are all big crazy business school things that like if you are going to be given this percentage number and not know what it means, then don’t even bother trying to figure it out. JM: Right, find somebody, so we delegate. JC: Yeah, delegate that, hire someone specifically to help you come up with financial dashboard or to forecast or invest in something that’s going to help you come up with an easy way to get those numbers. For example, with my inventory summary, it’s very easy to just go into our system and see how much inventory we have or if I have like something I was making, it’s fairly easy to just go into my garage and count how many I have of something or see how many boxes are still there. But also that is kind of one of the things that pops in your head that you want to go check real quick that takes away from time you should be spending on more focused bigger picture things. I made an inventory summary that basically I have to run one report or update only a couple pieces of information and then put it into the back end of my spreadsheet, then it populates the summary with all the information I want. Obviously, if someone’s not comfortable with Excel, they should ask someone to help them set something like this up and then teach them how to update it. But basically it makes it so I know if a cell is red, that is something that I need to look at. It’s a really helpful process that I put into place so that I can easily get numbers to help me know what to do rather than like we said before like reinvent the wheel, like go count things, or pull other reports, or start totally from scratch, every single time I need to figure out if the company is okay. JM: That sounds horrible. For how many times do we do that? It’s interesting because what I am hearing is that a lot of times, there are things that we either are not comfortable with because we haven’t mastered or things that you know, numbers are not my favorite thing unless things are going well then I love numbers, then let’s look at the numbers, let’s dive in. But generally speaking, it is a tricky thing for a lot of people, especially for people who tend to be more creative than analytical I think, but by investing and having an expert help you or just biting the bullet and saying, “Hey, this week is number’s week. I have to figure out what the system looks like and how much of it I can automate or make as easy as possible.” In the long run you’re really making such a huge difference, that has a huge impact on your business especially when you are talking about things like inventory or for us it is tracking participants in programs and looking at, “Well, gee, why didn’t that fill up? Was there an issue with the messaging, with the marketing? Is there a disruption in our industry where people want something different right now or are there some different trends that are happening?” When you don’t have that reporting in place, you don’t have that insight and so you are saving yourself a ton of trouble and misery down the road by being able to keep an eye on things as they are happening and just keeping it automated. I think too with things like inventory or if you need to order physical product, you really need to have a very good system because it is not as easy sometimes as walking out into your garage, and even if it is, who wants to do that? Once a week or several times a month like who wants to do that? Having that information means that you are not hitting those places where everything comes through a screeching halt because you don’t have what you need and you are waiting for it to show up or you don’t know, “Gosh, I need a contractor for this next six months because we have something big coming up,” it means really controlling that process and those outcomes and understanding so it makes a lot of sense to just have that in place whether you hire somebody to help you or you bite the bullet and deal with it yourself . JC: Yeah, I think that one of the best and worst things about being a female entrepreneur, being a small business is that you are agile, it’s like it’s great, you can respond very quickly to changes in your target market or if you get some sort of feedback, you don’t need to go to a whole like a bureaucratic chain of command to figure out how you’re going to change. It’s like you can change really quickly which is wonderful. But also it’s a bit of a trap in some regards because you can’t just run up to your garage and check your inventory or you can’t just like,”Oh, I’ll just go pop in the Google Analytics and see if that did anything,” you get so almost distracted by the ability to change so quickly and so much and so easily so it’s important to just make sure that you do standardized process as much as possible to cut down on that kind of distractibility of being able to reinvent the wheel if you wanted to. JM: You know I think that is such an excellent point. I would love for you to talk a little bit more about that, and please correct me if I’m wrong because I don’t do this all day like you do, I didn’t go to school for it, but when I think about operations, I do think about it from the perspective of we need a standard repeatable process and it’s how we have great customer service, it’s how we have clients who absolutely love our programs because they know what to expect and we know every single program, every single event, whatever we’re doing. We are setting expectations, we are delivering on expectations, we know when do we need to send out emails or communications. We are managing that expectation every step of the way because we have documented systems that we are repeating over and over and over again. I think you’re absolutely right because I remember in my early days when I was working out of my house and it was just me and I’m like, “Okay, I’m going to change this note to self on this post-it. Nope, going to stick it on the computer,” and now we’re doing something different, and then the post-it-note falls off or something else happens or especially when something unexpected comes up, that’s when we get into trouble when we don’t have that repeatable system in place. Talk to me a little bit about the importance of standardizing a process. JC: It’s important for so many reasons but ultimately it saves you time and it helps you keep track of things and then it helps you delegate things when you have the ability to or train a new person if you’re lucky enough to be able to hire someone to join your team. Basically, I mean, again, you should find the system that works for you, the system that you’re actually going to use like it shouldn’t be that writing down a process is a process. You can’t be like, “This week we’re going to completely map on custom systems how our documents work like how things flow through our company,” that can’t be what you [inaudible 00:31:59] because then you’re never going to change it if you even get to making it the first time. JM: I might suffer from a little bit of that kind of thinking. JC: I mean, I definitely suffer from wanting to play with new systems and come up with big shiny like Powerpoint presentations with a flowchart something, but then I know that I’m not going to finish it. JM: Ooh, I love that. JC: Yeah, I’m all about using Google Drive even though I hate Google Sheets because I don’t have as much functionality as Excel. I love that Google Drive makes it so that I can link between different documents and different folders and when I click the link, it actually goes somewhere. JM: [inaudible 00:33:45] links to work. We did that with Dropbox. I love the idea. I had not even thought of that, it’s like we’ve got process documents but they don’t necessarily link to the template or the copy and that alone is a great idea. JC: Yeah, or I mean if you are using Dropbox and you just want to even put the file path of like, “Okay, this is the file path to the folder with the things that you need now.” Your process should be documented for things that you do everyday so that when you hire someone to help you, you can hand them the training documents and they can go run with it and you can go back and check their work. Then you should also definitely do it for things you don’t do all the time. If there’s something that you do very infrequently then you should definitely document how you do it so that when you go to do it again, in six months or once a year, whatever it is, then you can just pull up that document, you don’t have to think about it, it’s going to go much faster. It’s going to be an easier task for you to tackle because you’re going to not have to reinvent the wheel. JM: And dig around looking for things. JM: We all do that. They’re so lucky to have you. JC: Even though all these things looked like, “Oh,” yeah, just make notes. JM: It’s so smart especially with events. JC: Yeah, because now it’s coming up on the show again and I can just pull up what we sold last year and then very quickly plan how many of each thing we’re going to bring this year. JM: That’s awesome. Jessica, I could talk to you forever. I would love to invite you to speak to one of our groups so I will be in touch with you about that. I appreciate this information because it is just one of those hot topics that we’re always talking about so I don’t know, I will definitely be in touch with you again and hopefully ongoing but I know that the people that are listening might have more questions or they might want to learn more about you, how can they find you? JC: They can go to jessicaculligan.com and just reach out through email through my website or they can go to cocoknits.com and email our customer service email which is knit@cocoknits.com. I manage that as well so I’ll see the email come through. I would love to help more and speak with you again. This is so much fun so thank you so much for having me. JM: Thank you. I really appreciate it. You are also on Instagram so they can look for you there which is how I found you. On top of all of your expertise, you are so damn creative. I saw the really cool, I think it was freehand, I know nothing about this so I’m just probably saying it all wrong but like the freehand embroidery that you did, it goes like floral on like a tote bag or something, oh, my gosh, you’re amazing, it’s so awesome. JM: Definitely go look for Jessica on Instagram for sure, I’ll make sure that handle’s in the show notes and if you would like to reach out to me, I always love to hear from you if you’ve got questions, if I can support you or provide you resources, or you can get all of the transcript in the resources and links to the things that we talked about like Asana, Jessica’s links, some of the software, Harvard Business Review, you can actually find all of that on the show notes on the site if you just go to brandwithcatalyst.com. You can click on Contact to find me or you can go to the Blog and Podcast tab to see all of the episodes and all of those resources. Jessica, thank you so much. JC: Thank you so much. I really had a wonderful time. JM: Thank you. Me to.